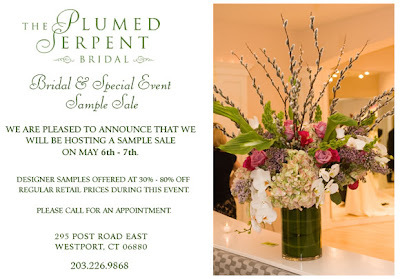 Sixpence For Your Shoe: The Plumed Serpent Bridal Sample Sale! Looking for high end design on a dime? Well then, this is the post for you! The Stylists at The Plumed Serpent are hosting a two day sample sale offering 20-80% savings! Their Annual Couture Sample Sale is featuring designers such as: Anne Barge, Monique Lhuillier, Romona Keveza, Rivini, Vera Wang and many more. Enter a Raffle to win Complimentary Veil and Headpiece to complete your wedding day wardrobe! Appointments are Recommended! We've had many a bride shop at the Plumed Serpent and they have always looked amazing.